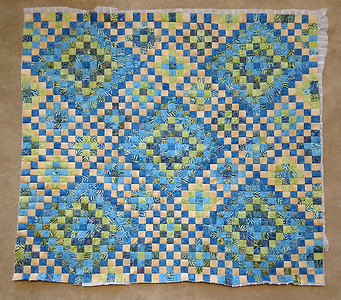 Despite a lot of things and a chart problem, I got this finished at last. I'm calling it Ripples unless someone suggests something better. Each square is 1". So this is a throw, but wow, doesn't it look nice? This is one of those that looks better from a distance, IMO, but when you look closer you can see all the variations in the batiks. Tonal "sand" color and five different batiks. Click for bigger. This entry was originally posted at https://laridian.dreamwidth.org/2910915.html. Please comment there using OpenID.